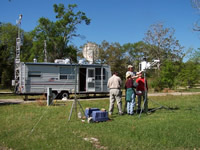 USGS scientists setting up mercury-aerosol sampling equipment in front of the USGS Mobile Atmospheric Mercury Laboratory at the Weeks Bay Estuarine Research Reserve, Mobile, Alabama. A team of U.S. Geological Survey (USGS) mercury scientists has developed a mobile atmospheric mercury laboratory capable of rapidly measuring the various forms of mercury and their concentration in air, in conjunction with relevant air quality and meteorological parameters. 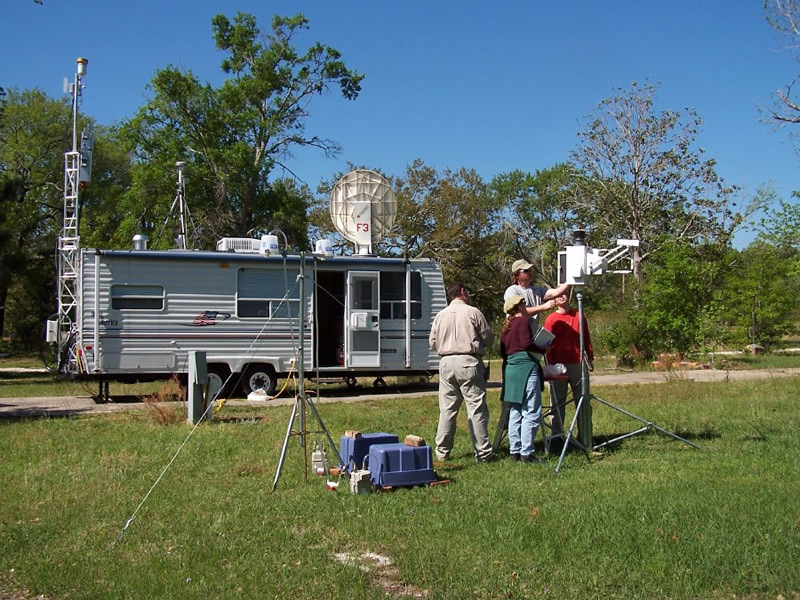 The combined mercury, air quality, and meteorological data collected by the mobile laboratory enables scientists to examine the relative importance of local, regional, and global mercury contributions. This relationship is important to evaluate in order to assess whether corrective actions on a local, regional, or global level would achieve improved environmental conditions at a given location.